inkyloulou Designs: Finally.......A blog......and a challenge entry!!! Finally.......A blog......and a challenge entry!!! Finally I have a blog!!!!! After lots of delay, questions, procrastination and general "I don't know how to work it!!!" I am finally blogging on my very own blog. Woo Hoo!!!! Thanks to my very clever little brother it is finally looking how I want it to and I know how to work it - so am looking forward to lots of blogging now and showing off of all things stampy. So where to start???? Do I go back to the very beginning of my Stampin Up stamping journey??? I think not. There are some cards in that collection that I don't mind but some which are definitely best left in the "Oh I was just starting out" file. So I thought I would start from my latest creations. What better way to start than with my first ever challenge entry. 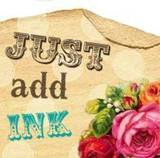 A couple of very talented Aussie and New Zealand Stampin Up Demos have started up their own challenge site "Just-Add-Ink" and I thought it was a great opportunity to have a play. Each week the girls will create a challenge for others to play along with. This week was a colour challenge. The colour combo was Taken with Teal, So Saffron, Whisper White, Chocolate Chip and Rose Red (which is by the way my very most favourite SU colour!!!). Card: Chocolate Chip; So Saffron; Whisper White. Hi Louise! Congratulations on starting your blog - it's looking good already! I'm flattered you've chosen to start off with your entry for our challenge. :-) It's a very cute card - I really like how you've combined those two sets. And I love that ribbon feature! I might just case that one. Thanks for playing! Congratulations on your blog! It looks amazing and I can't wait to see all your wonderful creations. I am so proud of you for being pro-active and doing something you love!! The blog looks awesome! Having a blog is so worth it so congrats!!! And BTW I LOVE this card!!!!!!! I got a feeling I'm gonna have to CASE this one too!!!! Hello and welcome to blogging and to your own little corner of the cyber world, its fabulous, so enjoy the ride, your card is just gorgeous sooo caseable LOL, I love the "magnifier" looking onto the butterflies, fabulous. Well done! looking good louise! welcome to blog world - hope you have a lot of time on your hands lol. your card is fabulous. a great combination of images. Wow! You have dived in head first with this blog and gorgeous card!! I'm always looking for new ideas with the Something Sweet Stamp set. Awesome. Wow you are a find..glad you are blogging! Love your card!! Welcome to the blogging world Louise lol and your little boy is such a cutie! Love your card, it's so cute and love the way you put the rub-on onto the ribbon, loving the butterflies too, great card! Welcome to the wonderful, amazing, fun and highly addictive world of blogging!! I love your blog, Louise!! And you entry for the Just Add Ink Challenge is gorgeous! Love the way you used the Something Sweet for a magnifying glass over the butterflies - so cute! Look forward to seeing more of your creations!